This is a continuation of my spelt brioche experimentation. This time I used 50% AP flour, 50% spelt flour, 50% unsalted butter, 32% eggs, 20% yogurt, 16% palm sugar/sucanat mixture, 2.5% salt, and a little instant dry yeast. I prefermented 20% of the flour in a liquid levain at 100% hydration using my rye SD starter. I am pretty happy with the result. It's a tangy bread due to the yogurt and liquid levain. I think next time I can up the sugar level... My total dough weight was approx 1200g, divivided between two 4.5" cube pullman pans. The dough only filled up about 1/4" the pan and had risen overnight to maybe 1" from the top. The oven spring was impressive, about 1" over the pan. Here is the crumbshot below. This one turned out really well for winging it. It's a mix of a bunch of stuff, freshly cracked rye, spelt, wheat berries, rye flour, pumpkin/flax/sesame seeds, old bread, rye sourdough, spelt stiff levain, barley malt syrup, blackstrap molasses. 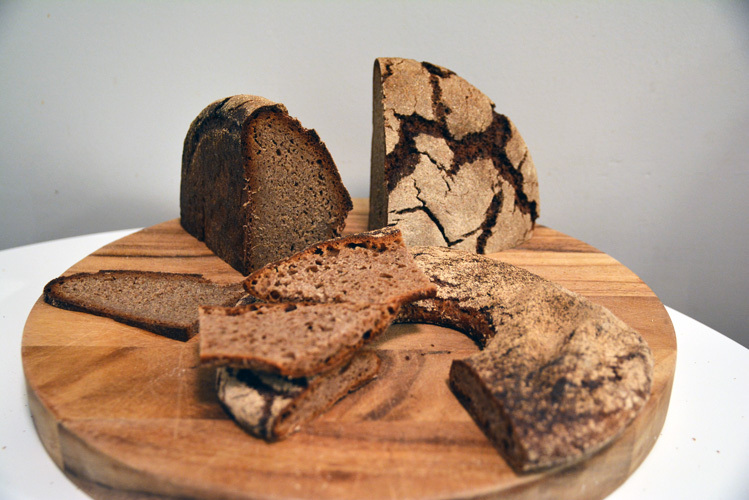 My attempt consisted of 95% rye flour, 5% AP flour, water, blackstrap molasses, barley malt, salt, caraway seeds. 1:00pm - Mix rye SD, cover and let rest. 11:40pm - Add 100g rye flour to SD, mix, cover and let rest. Decide to attempt making pandoro with 100% spelt flour (Arrowhead mills). 11:45pm - Place starter in refrigerator. 8:01am - Take starter out of fridge. 9:30am - Place starter in microwave with a cup of hot water, just to keep starter warm. My kitchen was cold. 11:00pm - Place dough in lightly oiled covered container, place in fridge. 10:40am - Preheat oven to 380F. 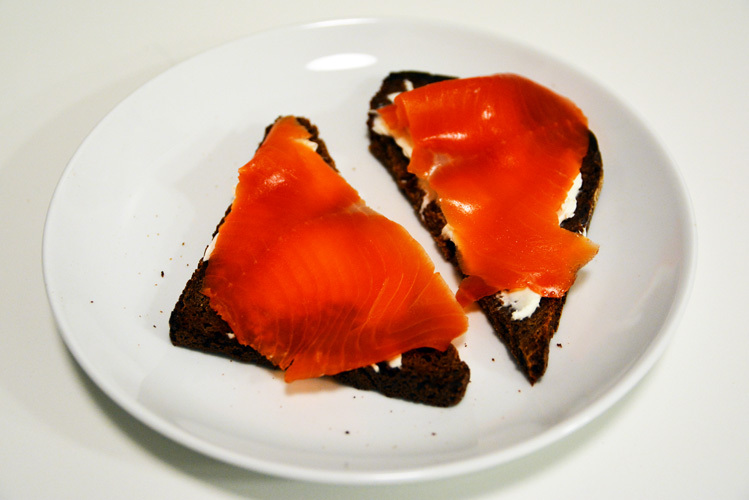 I am fortunate enough to live in NYC and was able to find Nordic Bread’s rye bread Ruisreikäleipä at Dean & Deluca. I got it just to try and see what it was like. It’s 100% locally grown organic rye flour. It’s quite soft, light textured, and sour. Whatever rye SD I had leftover, probably about 50g. 6:30pm - Mix SD, cover and let rest. 9:45pm - Mix, cover and let rest. 6:30pm - Mix all ingredients with a wooden spoon, place in covered container and let ferment for 3 hours. 10:00pm - Flour work surface well with rye flour, shape dough into a cone, place on parchment paper, cover with towel, let rest for 2 hours, or until surface is cracked. 11:00pm - Place baking stone on middle rack in oven along with steaming device, preheat oven to 500F. 12:00am - Bake for 10 minutes at 500F, then 80 minutes at 400F, then 10 minutes in off oven. Internal temp should be approx 210F, and loaf should weigh approximately 15% less than pre-baked weight. Cover in aluminum foil, then in kitchen towels and let rest for at least 24 hours. I let mine rest for 2 days before cutting. 8:50am: Mix spelt SD, cover and let rest. 9:25pm: Add 100g spelt flour to spelt SD - 1 to make SD - 2, mix, cover, let rest. 10:45am - Weigh out all ingredients for final dough, placing wet ingredients (not including butter) in large mixing bowl first, then dry ingredients. Mix will with wooden spoon, then plastic scraper for a few minutes into shaggy dough, cover and let rest. 11:45am - Stretch and fold (turn dough) in container, cover and let rest. 12:05pm - Stretch and fold (turn dough) in container, cover and let rest. 12:30pm - Stretch and fold (turn dough) in container, cover and refrigerate. 6:00pm - Stretch and fold (turn dough) in container, cover and refrigerate. 9:00pm - Shape dough, place into greased tin, cover with plastic wrap, refrigerate overnight. 10:10am - Take dough out of refrigerator, place on counter. Place rack on middle rack with baking stone. Preheat oven to 380F - 400F. Small Pain de Mie Pullman Bread Pan with Lid, 4.5”. Here are the gratuitous bread shots... All 360 degrees of it! 7:40pm - Soak old bread mix in water. 11:00pm - Mix biga, place in covered container on counter, let ferment. 11:10pm - Transfer soaked old bread to covered container, refrigerate. 2:40pm - Weigh out all remaining ingredients using a digital scale. In a large mixing bowl, place old bread soaker and mash with hands until reasonably smooth and there are no large chunks. Cut up biga and place on top of old bread mash, add salt and flour. Mix with wooden spoon until a dough is formed. Continue mixing by hand. Do not add any additional flour. Knead for a few minutes until flour is hydrated. Place in lightly oiled continer, cover and let rest. 6:00pm - Turn dough (stretch and fold) and form into ball, cover and let rest. 7:45pm - Preshape into boule. 8:00pm - Final shape into boule, lightly dust with flour, using a bench knife, make 3 cuts like a "peace sign" almost all the way through, transfer cut side down into lightly floured basket, cover with towel and proof. 9:35pm - Place dutch oven into oven on middle rack, preheat to 450F. 8:30pm - Mix poolish, cover and let rest. Measure out 700g of goat milk, scald in saucepan and let cool (in ice bath if necessary). 11:00pm - Mix all ingredients until all flour is combined with liquid and there are no dry bits in large mixing bowl. Cover and let rest. 11:30pm - Turn dough, transfer to lightly oiled plastic tub at least 3x size of dough (6L), cover and let rest. 12:23am - Turn dough, cover and let rest, go to bed. 7:00am - Turn dough out onto floured surface, divide into 4 equal pieces, shape, proof on lightly floured linen couche, cover with plastic, proof. 8:00am - Prepare oven with 2 baking stones and steam pan filled with lava rocks and water. Preheat to 500F with convection. Long time no post here on TFL. I have been working a little too much these days to post, how ever I have been baking about once a week. 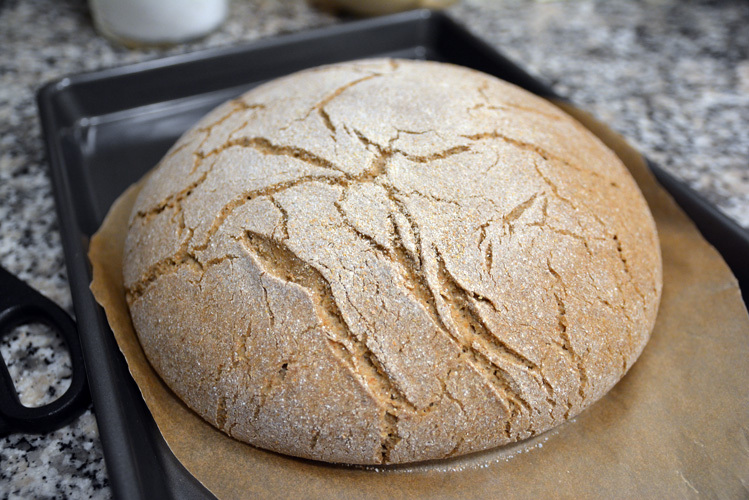 I have been baking very whole grain breads with rye lately, and had some grains in the freezer that I wanted to bake with… So here's what I came up with…. For flours, I am using Whole Foods Market 365 Organic AP and whole wheat flours, and Arrowhead Mills Organic Stoneground Rye Flour. The OG rye and spelt berries are from Fairway Market in NYC, the OG flax seeds and wheat germ are from a little organic market. The water is NYC tap water. 10:00pm - Weigh out spelt and spelt berries. Coarsely grind using grain mill. Mix with water, place in covered container and refrigerate. Mix flax seed soaker, place in covered container. Refrigerate. 9:30am - Take biga out of refrigerator, place on counter at room temp. 10:00pm - In a large mixing bowl, combine the spelt/rye soaker, flax seed soaker, AP flour, and wheat germ. Mix with wooden spoon until well combined, place into lightly oiled container, cover and let rest. 10:30pm - Cut up biga into pieces, mix into final dough using wet hands until well combined, cover and let rest. 11:15pm - Knead in salt with wet hands until well combined, cover and let rest. 12:30am - Scrape dough out of container on to well floured surface, shape into boule, place into well floured linen lined banneton/basket, cover with tea towel, place into plastic bag and let proof overnight. 6:00am - Place baking stone into oven on middle rack along with steam pan filled with water and lava rocks, pre-heat oven to 500F with convection if you have it. Be sure to place an oven thermometer on the baking stone so you can tell how hot the stone is. 6:30am - Turn off convection. Turn boule out onto lightly floured peel, brush off excess flour, dock dough with bamboo skewer or Japanese style chopstick, place boule into oven directly on stone and bake at 500F with steam for 15 minutes. After, remove steam pan and turn oven down to 425F and bake for another 60 minutes. Turn off oven and leave loaf in for another 10-15 minutes. When finished baking, internal temp should be approx 210F and weight should be about 15% less than before baking. Cool and rest for about 12 hrs before cutting.